Camden Hunter’s Creek features beautiful one, two and three bedroom floor plans with walk-in closets, soothing bath tubs, built in computer desks, linen closets, ceiling fans, and a full-size washer and dryer. The open kitchens include stainless steel appliances, tile backsplash, kitchen pantries and ceramic tile. Some apartments have beautiful screened in patios so you are able to enjoy the gorgeous Florida weather while relaxing just outside of your apartment. 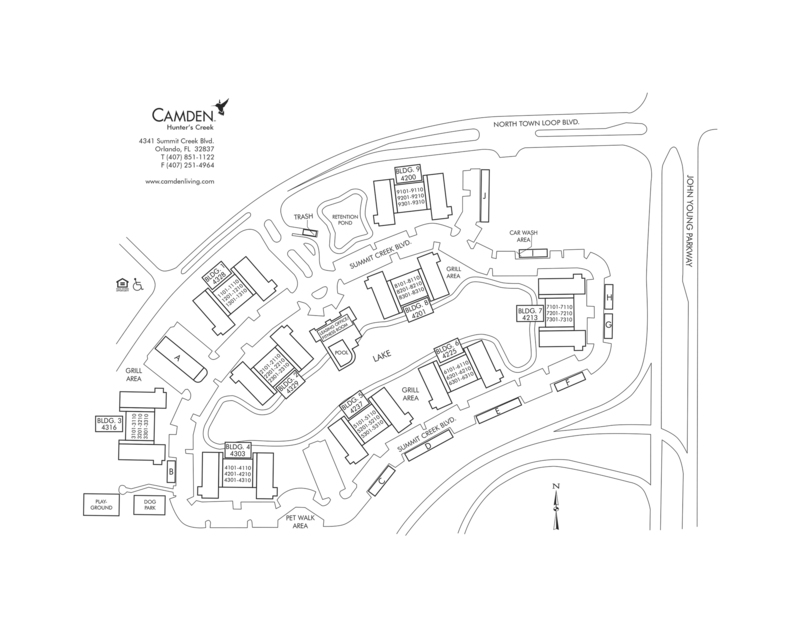 Whichever floor plan you choose, you will love living at Camden Hunter’s Creek. Take a relaxing dip in our pool or enjoy the sun on our pool deck. Cook up a burger on one of our two BBQ grill areas or stop by our coffee bar inside of our clubhouse. We also offer a 24-hour fitness center with free weights and cardio equipment so you can meet your fitness goals. Camden Hunter’s Creek has everything you will need! Conveniently located near State Road 528 and 417, we are in a perfect location for every commuter. Pick up your groceries at Sedano’s, Publix and WalMart Neighborhood Market which are only a few minutes away. Don’t feel like cooking? Tijuana Flats, Subway, Longhorn Steakhouse, KeKe's Breakfast Café are just around the corner. Want to shop until you drop? The Loop and The Florida Mall are just a quick drive down the road. Camden Hunter’s Creek is a premier location! We love pets and welcome them with open arms. Your pets can stretch their legs at our fenced in dog park or on a long afternoon walk around the community. With our pet washing station, getting your furry friend clean quickly is a breeze. We are also just two miles away from Osprey Dog Park and only three miles from Vista Dog Park where you can meet and mingle with other local pups and their owners. Have kids? They will be able to attend top rated schools within our area. West Creek Elementary, Hunter’s Creek Middle School, and Freedom High School are all Florida rated “A” schools. Your kids will also love our fun playground that is right in the middle of our community. Residents also receive a technology package through Spectrum included in their total monthly rent. This money-saving package includes high-speed internet with speeds up to 50 Mbps, WiFi, and more than 300 digital channels with over 100 in HD. Come home to Camden Hunter’s Creek, where living excellence is our mission. Call today to make an appointment to see your beautiful new apartment home! Get the perfect spot! We have ample open parking for all residents and visitors on a first-come, first-served basis. Detached garages are available to rent for $85 month. Large storage spaces are available for $45 per month.